October 2014 was the warmest October on record. Seriously, Earth, this whole global-warming thing is getting old. According to new data released Friday from NASA and the Japanese Meteorological Agency, last month was the warmest October globally since official weather records have been kept in the late 1800s. According to NASA, last month tied with 2005 as the warmest October on record globally. 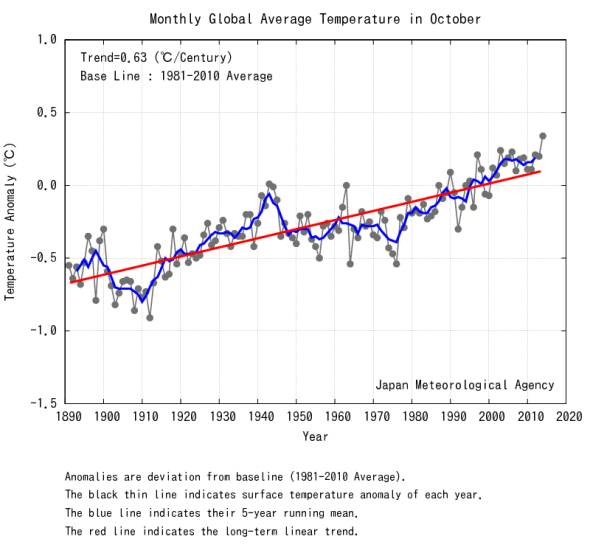 Japan’s data show the month as significantly warmer than October 2003, its previously warmest October. There wasn’t such a thing as October the last time global temperatures were this warm, which recent research has dated to at least 4,000 years ago. That fact brings a bit of context to the litany of new worldwide temperature records set in what’s shaping up to be an exceptionally warm 2014. Case in point: After a relatively cool start—January and March were only the fourth- or fifth-warmest months globally, depending on the data set you choose—this year has already featured the warmest April on record, the warmest May on record, the warmest June on record, the warmest August on record, the warmest September on record, and the warmest ocean temperatures on record for any month (twice). Buried within the surge of warmth was the warmest six months on record (April to September), and last month capped off the warmest 12-month period on record. April was the first month in at least 800,000 years that atmospheric carbon dioxide reached 400 parts per million. It’s this sudden surge of heat-trapping gases, released by human activities, that’s driving climate change and pushing global temperatures to new highs. The record-breaking probably isn’t done yet. The persistence of off-the-charts ocean temperatures has helped push 2014 to the front of the pack, and it’s increasingly likely that records will continue to fall for the rest of the calendar year (and perhaps well into 2015). Climate Central has an interactive graphic using the latest NOAA data (through September) that illustrates the scenarios that would lead to a record-warm 2014. Considering NASA’s newly released October data, I’ve calculated that November and December need only be the third-warmest on record for this year to come out on top. The string of records is all the more astounding given that El Niño—a periodic warming of the tropical Pacific Ocean linked to other record-warm years, like 1998, 2005, and 2010—is sputtering to get started this year. If we no longer need a cyclical warming of Earth’s largest ocean to produce record-warm years, in my view, it’s a sign that global warming has entered a scary new phase. October 2014’s global temperature record was well ahead of previous Octobers.